X PlusOne kickstarter project – is it a Drone or a Plane? Is it a drone? Is it a plane? No, it is the X PlusOne, a kickstarter project from team xcraft looking for backers to support the mass production of what seems to be a combination of multirotor agility together with a fixed wing speed and efficiency. 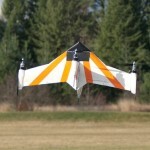 Obviously drawing it’s inspiration of google’s project wing, this ariel machine (DronePlane? PlaneDrone?) can do VTOL, reach claimed speeds of 100 KPH and carry ariel photography cameras such as the GoPro and a gimbal. If proper funding goes right for the developers, they would add autonomous capabilities using the popular Pixhawk flight controller (offered by 3D-Robotics). Want to support this project? Check out the kickstarter page here. Also checkout the video after the break.